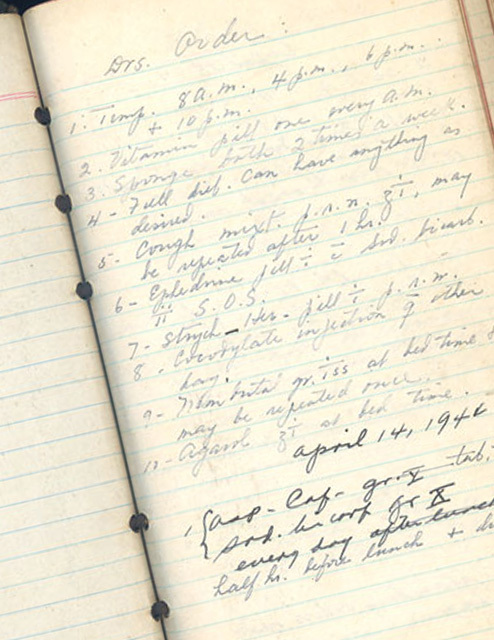 About the diary: This was the clinical record kept by the doctors and nurses of President Manuel L. Quezon during the last months of his life, from April 18-August 1, 1944. 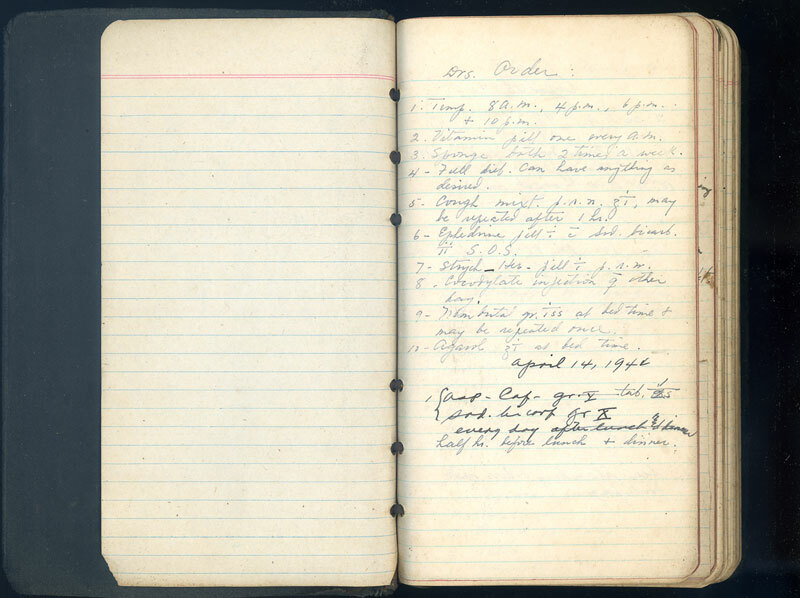 The clinical record, a small notebook, was in the possession of Mrs. Zeneida Quezon Avanceña, President Quezon’s daughter, until the year 2003, when she gave it to Manuel L. Quezon III. The entries are in different hands, though it does not identify who, specifically, made each entry on the various dates. This Clinical record for President Quezon commenced from the time we took the train from Miami, Florida, April 18, 1944. 1. Temp. 8 a.m., 4 p.m., 6 p.m. + 10 p.m.
2. Vitamin pill one every a.m.
3. Sponge bath 2 times a week. 4. Full diet. Can have anything as desired. 5. Cough mixt. p.r.n. z 1/1, may be repeated after 1 hr. 6. Ephedrine pill ⁒ /c Sod. bicarb. **/11 S.O.S. 7. Strych_Her. pill 1/1 p.r.m. 8. Evedylate injection /g other day. 9. Nembutal gr. 1/155 at bedtime & may be repeated once. 10. Agasol z 1/1 at bed time. This diary, perhaps the only one of its kind, as far as chronicling the last months of the life of a major historical figure, is published online both for the insights it provides into the treatment of Tuberculosis patients in the 1930s and 1940s, and the glimpse it provides into the last months of the life of President Quezon. 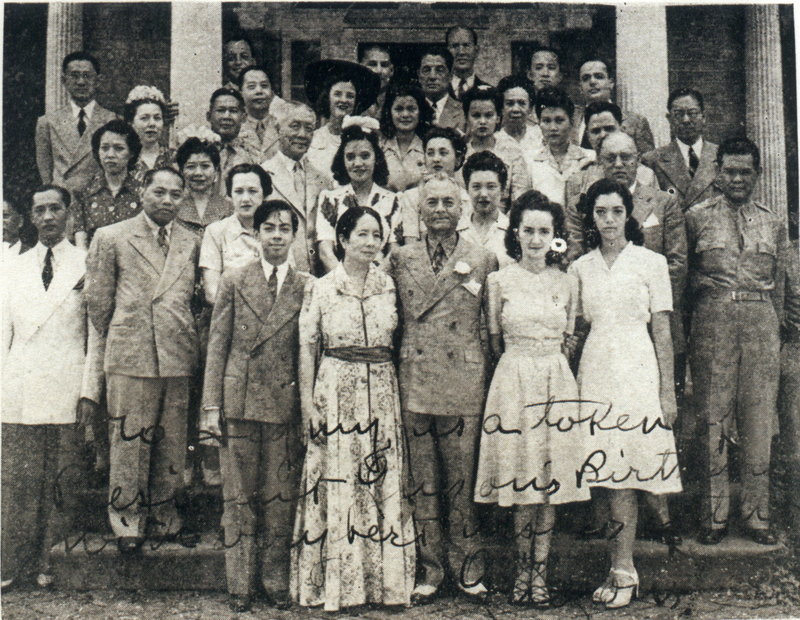 Commonwealth government-in-exile and members of the Filipino community, Leesburg, VA, shortly after President Quezon’s arrival, May, 1942. President Quezon’s doctors are: (2nd row, first on right) Benvenudo R. Diño; (2ns row, 2nd from right) Dr. Andreas Trepp; (2nd row, 1st from right) Emigdio Cruz. Dr. John N. Hayes: Tuberculosis expert in Saranac Lake, New York; there is a profile in the HSL Wiki. Dr. Emigdio Cruz: A profile of Dr. Emigdio Cruz, who was the lone recipient of the Medal of Valor from President Quezon, can be found in View from the Pampang. 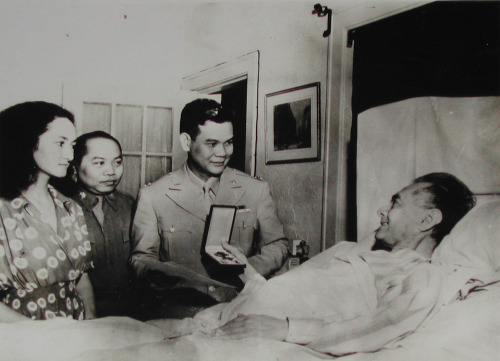 President Quezon confers the Medal of Valor on Major Emigdio Cruz, Miami Florida, March, 1944. Dr. Benvenuto R. Diño: Accompanied President Quezon into exile. Dr. Andreas Trepp: First director of the Quezon Institute; Swiss Tuberculosis expert; accompanied President Quezon into exile; died in Washington, D.C.
Gen. Basilio J. Valdes, Secretary of National Defense and Chief of Staff of the Philippine Army, was also with President Quezon in Saranac Lake. Manuel Quezon, the president of the Philippines, came to Saranac Lake in June 1943 and again in June 1944. He had been invited by President Franklin Roosevelt to establish a government in exile in Washington, DC, but Quezon had tuberculosis and was looking for a better summer climate. The McMartin camp was secured for the visiting head of state, as were the services of Dr. John N. Hayes, a specialist at the Trudeau Sanatorium. Quezon and his staff stayed at the lodge on the lake and he claimed to be much improved after his first Adirondack summer. However, when he came back in June of 1944, he was much worse, and he died on August 1st. After a high mass celebrated by Dr. Hayes’ brother, the Most Reverend Ralph L. Hayes of Pittsburgh, who just happened to be visiting, the body was taken by special train to Washington, D.C.